Have you heard all the buzz about Girls Auto Clinic? Girls Auto Clinic is a female empowerment company that educates, empowers, and caters to women by offering automotive buying and repair resources, services, and products based on trust, education, inclusion, and empowerment. It’s no secret most women hate their automotive buying and repair experiences because we feel misunderstood, taken advantage of, and/or mistreated. To make things worse, the automotive industry has not done much to ease concerns, anxiety, and fear despite the fact more than half their customers are women and spend $200 Billion (with a B) a year on buying and repairing their cars. Patrice Banks was once one of these women. A self-proclaimed “auto airhead,” Patrice created a business model that supports a need in the lives of millions. Girls Auto Clinic. Too many of us women feel powerless when it comes to their cars. Mechanic-speak sounds like a foreign language, and the auto repair bill contains a lot of unnecessary or overpriced repairs. How do you tell if you need new brakes? How often are you supposed to change your air filter? What does that light on your dashboard mean? THE GIRLS AUTO CLINIC GLOVE BOX GUIDE has all the answers. It’s a one-stop do-it- herself guide to auto maintenance, repairs, and roadside emergencies. Author Patrice Banks, a self-described “auto-airhead,” was like many of us: she didn’t know the first thing about her car, and was accustomed to ignoring the dashboard lights because she felt so uncomfortable taking her car in. She sought out a female mechanic and found that, despite making up the majority of car owners and licensed drivers, women account for less than 2% of auto mechanics. So Patrice took her engineering degree and became a certified automotive technician, giving auto-workshops to women and girls all across the Philadelphia area. Now with THE GIRLS AUTO CLINIC GLOVE BOX GUIDE, Patrice will empower all women to take care of their cars. "It’s simply written, it’s not condescending or cutesy, and it removes the mystery from something that many of us find a little scary. “Girls Auto Clinic” is not about how we feel about our cars; it’s about what we can learn to do. And that’s some pretty excellent roaring right there." "This comprehensive DIY guide is indispensable for everyone who owns and maintains an automobile." "It’s quite a remarkable feat to make such an extensive automotive manual not only informative but also so relatable and entertaining. Banks’ reassuring voice and vast knowledge jumps off the page, and it feels like you’re learning from a trusted friend." Looking for something for that special someone? Little Village has a variety of cards, valentines and gifts that will do the trick! What better way to start a new year than to focus on living a happy, balanced life? Scandinavian countries are known for being the happiest places on Earth- what's their secret? Living mindfully, in moderation and focusing on comfort. For the Swedes it's Lagom (pronounced lah-gohm), for the Danes its Hygge (pronounced hue-guh). Lagom and Hygge are ways of living that promote wellness and mindfulness. Hygge is a Danish word that is used to acknowledge a feeling of contentedness, charm, coziness, security, and comfort. It is also referred to as the “art” of creating intimacy and charm in everyday situations that some of us might consider boring and mundane. For instance, something a simple as taking a moment each morning to brew your favorite coffee while lighting a candle before jetting off to work, or by treating yourself to a bubble bath with epsom salts and essential oils once a week, are both ways of bringing hygge into your life. It essentially involves finding little charming moments that help break up the monotony of your day or week and help you slow down. Lagom is a Swedish word that is similar to hygge, but with a few key differences. It comes from the phrase, “Lagom är bäst,” or “Just the right amount,” and reflects the idea of always living life in balance that doesn’t have too much of too little of one thing or another. Lagom plays a huge role in living sustainably, encouraging working with the environment in your day-to-day life, choosing natural and simple whenever possible, and shopping locally. However, the art of lagom can be applied to all areas of life, from indulging in desserts, to working, and even decor. The key to understanding lagom is “not too much, not too little” of everything in life. Here are a few books that can help you shift gears from "go-go-go" to mindful moderation and calming coziness. Come down to the shop, grab yourself a copy & a cup of coffee and you'll be on your way to a happier life. The Tyler Blain House, located in Lancaster, New Hampshire, is a 4-bedroom Victorian home. It is ADA compliant and has the ability to house up to 8 individuals at a time. Shelter guests have independent access to a large eat-in kitchen, a community food pantry, laundry facilities and a common area. Food and material goods assistance are provided as needed. On-site staff provides individualized case management services to all shelter guests, including help with transportation. Staff also assists shelter guests in developing plans to meet their goals of being self-sufficient and securing permanent housing. All are welcome at Tyler Blain, except individuals who are a safety threat to themselves or others, and unaccompanied minors. Our goal is to alleviate immediate housing emergencies and to assist shelter residents with achieving independence that leads to permanent housing and ends the cycle of homelessness. When the tragedy of homelessness occurs, people often feel disconnected from their community. 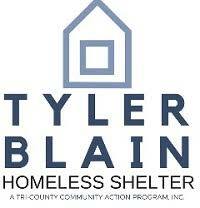 At Tyler Blain, we believe that a successful approach to shelter happens in the context of a supportive community–one that focuses on including the person in a meaningful experience. For this reason, when people stay at Tyler Blain House, they are engaged in a total community living arrangement. We believe everyone heals at a different pace, and for this reason, there is not a limit on the length of time an individual may stay. We ask only that residents be pro-active in their plan for independence. For after-hours homeless emergencies, please dial 211 for assistance. Extended Holiday Hours Start this Friday! Elf on the Shelf Sale! It's Festival Time! Liven up your festival experience with some of these games & toys that are available here at the shop. 3” light up ball with non-replacable batteries. Quality is what sets Far Out Bubbles apart from the other bubble products. My mix is dependable and makes long lasting giant sized bubbles. This kit includes 1 wand and bubble mix. The 8 ounce bottle of bubble mix makes 1/2 gallon of bubble solution. The bubble wands are 18”, available in 7 fun colors, and are topped with a natural wooden bead. Great Outdoor Play for All Ages. Catcher and launcher in one. Captivating game of toss and catch. Sling to throw. Jab to catch. Buddha Board is inspired by the Zen idea of living in the moment. You simply paint on the surface with water and your creation will come to life in bold design. Then as the water slowly evaporates, your art will magically disappear leaving you with a clean slate and a clear mind, ready to create a whole new masterpiece. Buddha Board is environmentally friendly as it only uses water - no ink, no paint, no chemicals - and it will last for years with proper care. Live for the moment and enjoy! A frisbee that can fit in your pocket! 4 Player croquet set includes four 32” long mallets, four (75 mm) tough resin balls, 2 pegs, 10 wickets, official playing instructions. Quality hard wood. Giant dominoes stretching across the park, garden or beach is great fun for any gathering. Share the dominoes between the whole family and whoever has the ‘double six’ starts this skilful battle of wits. 28 Dominoes. Take turns to remove a block from the tower and place it on the top. Shout your deal and trade your cards to “corner” the market. Be the first to get all the cards of one commodity, slap the “Corner!” board and you’ll win the hand. You’ll feel like a trader in the “pits” of the exchange! Beware of the Bear and take your chances with the Bull. PIT is great frenzied fun. Contains: 74 cards and “Corner!” board. For 3 to 8 Players. Bounce water balloons back and forth - but don’t drop them! OgoDisk H2O is the first OgoDisk specifically designed for bouncing water balloons, with a sturdy outer ring and fast-drying mesh. Lightweight disk flies and floats, and includes 50 water balloons. Three years ago while living in their 800 square foot apartment, brothers Duncan and Hayden together with their mother, Elisha decided to figure out a way to earn some extra money. Being huge fans of playing in the outdoors, Duncan and Hayden, under their creative, entrepreneurial guidance of their mom, took out a $50 loan from their mother to create and develop a durable, kid-friendly nostalgicbow and arrow. The boys and their mother then took their finished product to a local craft fair to sell their bows and arrows. The boys sold 15 out of 18 bows and arrows they made and they used the profits to reinvest and do more shows. It was during this time that they picked up their first gift shop to sell their products and they also caught the eye of a toy sales representative who wanted to carry their line. From these early beginnings, Two Bros Bows, LLC was born. Three short years later, Two Bros Bows is now a million-dollar business in over 800 speciality stores across the country as well as internationally. The boys have won numerous awards in the toy industry and continue to develop their skills as Kid Inventors and Entrepreneurs. From the boys basic beginning of learning how to make and sell a bow and arrow, they are now helping Elisha with marketing, creative design, and promotional social media opportunities and guest appearances. “Work hard, play hard” has always been the family’s motto in life and it has paid off for the boys! Duncan and Hayden are excited that children all across the country are rediscovering their own adventurous spirits and heading out to explore nature and have fun with their toy bow and arrows made by Two Bros Bows, LLC! Yoga Spinner is a delightful introduction to yoga that encourages teamwork and healthy physical activity. Give the spinner a whirl and perform the pose on the corresponding Yoga Pose Card. If you can hold the pose for 10 seconds, you keep the card, and the first player to collect a card in each color wins! You’ll need a little luck and teamwork, and a bit more flexibility and balance to win this entertaining yoga game. Laser X is a Real Life Laser Gaming Experience. Set includes everything you need for 2 Laser X players. Blast your opponent’s Receiver Vest from up to 200’ away. Full Color Lighting Effects let you keep track of shots and hits. Interactive voice coach gives tips, feedback during the game. Plug in headphones and hear the Laser X Soundtrack and Sound Effects. Compatible with all other Laser X sets. Play as teams or as individuals. One of the world’s favorite dice games, Farkel is a fun, fast-paced, high-score game that takes minutes to learn and enjoy. LCR (Left Center Right) is a very popular, fast-paced dice game that you won’t be able to put down! Three specialty marked cubes are rolled to determine where players distribute their chips as they compete to keep as many of their chips as they can. The last player with chips is the winner and wins the center pot. Lots of fun for the whole family! Game includes three specialty marked cubes, 24 chips and instructions. For 3 or more players ages 5 to 105! Your mission, should you choose to accept it: become a secret agent of joy, spreading art and intrigue to an unsuspecting public. Inside each box is an interactive scavenger hunt that will inspire creativity and reward audacity. Take a selfie with a stranger, create a collaborative doodle, become a flash mob of one. Complete an objective and then pass the card along to an unwitting accomplice, who now becomes part of the game! The fun is ever expanding, but it all starts with you. Play it forward! KOOBA is a next-wave magnetic target game that’s totally unique and incredibly fun! Using two sticks to launch a magnetic “aero”, KOOBA combines dexterity with knock-em-out strategy for a game that performs like a sport and plays like a board game. A perfect game for parties or family get togethers, KOOBA is intensely competitive, easy to learn, yet always a challenge. It’s a multi-generational game that lets the whole family play and compete. KOOBA blends board game strategy with target game skill. The magnetic game pieces can be used for scoring, attacking, blocking, and more! KOOBA isn’t just one game, it’s a gaming platform. Play with 2, 3, 4 players or go big with teams up to 20 people! KOOBA comes with rules for the official KOOBA game, but also comes with 2 more games that can be played on the same board. New games and mods are fun to invent and share with others! Made with strong rare earth magnets and durable, quality materials. All the pieces stay firmly on the board for easy storage. You can either hang the board on a hook or even turn it sideways and lean it up on a cooler for tailgating. KOOBA also won’t damage your walls like regular darts, so it’s perfect for the living room, game room, office, or dorm room. It’s a great game to bring anywhere people get together for fun and exciting competition! Train like a Ninja with the patented NinjaLine 30’ Intro Kit with seven hanging obstacles. This kit allows the versatility of moving the obstacles further apart as your skills improve as well as includes obstacles that vary in skill level. Easy to install and take down means that you can take your training with you. Includes: storage bag for easy portability, 30’ x 2” slackline webbing with steel ratchet and rubberized grips, a three piece 10” nylon rope Monkey Fist, a two piece 16” Monkey Bar Hold, and two piece gymnastics rings with textured grips. All obstacles include steel hanging delta safety clips. Hang in between two posts or healthy trees. Create fun, temporary tattoos with Ink-a-do Tattoo Pens. This set includes six (6) gel pens in a variety of vibrant colors. Three (3) plastic stencils contain a variety of designs to inspire cool new tattoos. The gel pen ink is non-toxic and completely washable. Ink, wash and repeat for hours of creative fun. Recommended for ages 6 years and up. Constructed from a single strand of flexible metal, the Cosmic Coil transforms into a mesmerizing spherical ring that revolves around itself like a metal bubble and collapses flat with a twist for easy storage. Perform cool tricks and share the amazing experience of the Cosmic Coil. Measures 5” in diameter when flat and 10” when open. Fascinating fidget toy! Includes pouch. Out of this world, watch it roll, bend and flow! Take these durable and portable doodads on your next outdoor adventure, whether it’s for family camping, hiking a fourteener, or fort/shelter building in the forest. Most of our designs are great for these purposes. Due to high demand, we’ve created a camouflage kit tailored specifically for outdoor sport. The material is the same, but we adjusted the colors and provided you with the ideal shapes for these adventures. Survivalists recommend keeping a few Stick-lets in your trunk or backpack for safety purposes as well! 4 Synchro Motors, 4-Axis Navigation, 30 ft. Range, 2 Channel Wireless Control. Includes: Rechargeable Lithium Battery, Handheld 4-Axis Controller, USB Cord and Extra Rotors, Storage Case. Spinballs features a set of glowing LED poi attached to adjustable leashes. Spin them around in rhythmical and geometric patterns to create a visual effect. It’s fun to do and fun to learn – for parties, festivals, and night outings, or to practice physical coordination! You can do it all with Spinballs. Dress up with Spaghetti Headz! Twist up your dress-up with our fun three pack of twists and charms! Made of polymer clay, Spaghetti Headz are eco-friendly swirls of fun in funky new styles for kids of all ages. Steps: 1. Take a thin section of hair (about the width of a pencil) and twist it once or twice. 2. Place the twisted section of hair under the top loop and hold it in place. 3. With your other hand, wrap the hair in a counter-clockwise direction. The Foam Strike Switchblade Boomerang springs to life with the touch of a button. Folds down to fit into your pocket. The 13” diameter is soft and pliable for easy throwing and catching. Juggling sticks combine 2000 years of tradition with modernmaterials. Flexible fiberglass baton, wooden control handles,weighted leather tassels. Campsite or mountaintop.Assorted colors. Start searching for Waldo and 2017 bonus book character Wenda ASAP and qualify to win prizes! Pick up your passport here at the shop! The hunt starts in a few days and Waldo’s feeling as elusive as ever…don’t forget to pick up your passport here at the shop! It’s that time of year again...WALDO IS BACK! 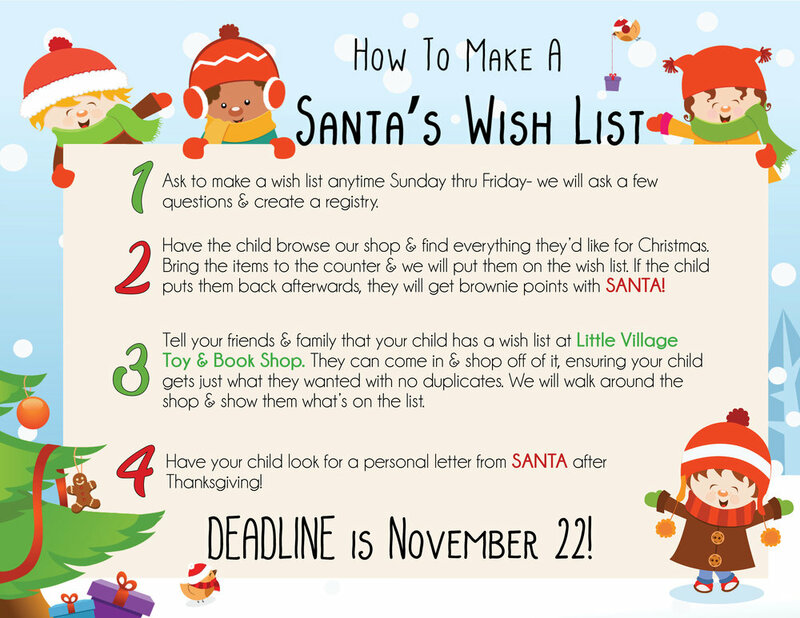 This July, Little Village Toy & Book Shop will once again be hosting an exciting month-long scavenger hunt to find Waldo in participating local businesses in Littleton. How it works: The first 125 players who collect store stamps/ signatures from at least 10 different businesses and turn their passports into the book shop win an “I Found Waldo” button and a “$1 Off (Where's Waldo Books)” coupon. Players who collect at least 20 of the 25 possible stamps/signatures win an “I Found Waldo” button and a “$1 Off (Where's Waldo Books)” coupon PLUS they are entered in a drawing on July 29 for other larger prizes. Some things never get old... Take a trip down memory lane with the toys that you played with as a kid. Slinkys, Ray Guns, Etch-a-Sketch, Silly Putty, Gyro Wheels, Silly String (and so much more).... still available after all these years and waiting for you at Little Village Toy & Book Shop!